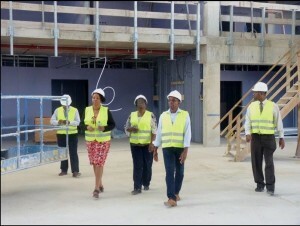 WILLEMSTAD – The construction of the new hospital in Otrabanda is advancing steadily. Recently the Minister of Health, Environment and Nature, Sisline Girigoria paid a visit to the project. The Minister was received by Mr. Doran and Mr. Hart, both from the financing institution SONA. Doran gave a general introduction and also gave a more in debt presentation using a miniature model of the project. Mr. De Wit of Ballast Nedam/Renaissance Construction also gave a presentation. The Minister also took note of the LEED Gold certification of the project. Leadership in Energy and Environmental Design is a rating system devised by the United States Green Building Council (USGBC) to evaluate the environmental performance of a building and encourage market transformation towards sustainable design. Now that the Minister has more information on the progress of the project, she will meet with the SONA representatives to delineate the conditions to guarantee that the new hospital will be ready on time without additional costs.